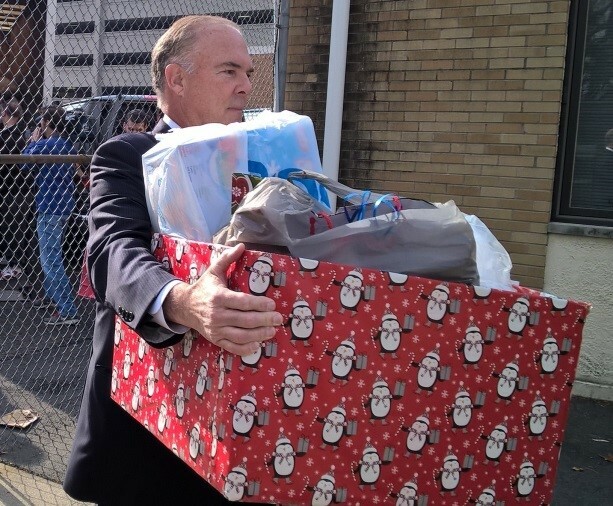 (16/P120) TRENTON - Department of Environmental Protection (DEP) Commissioner Bob Martin and staff delivered more than 1,000 holiday presents for 231 children at the The Salvation Army Corps in Trenton today, as part of Governor Christie’s annual Season of Service campaign that helps state residents in need during the holidays. DEP staff donated the gifts to the Salvation Army’s Angel Tree program. Over the past six years, the DEP has delivered gifts for 720 children. The 231 children who were provided gifts is the most DEP has delivered in its involvement with the program, which brings new clothing or toys to children of needy families through the support of donors. The Salvation Army West Central Region serves Mercer, Hunterdon and Somerset counties, and is collecting toys and gifts for a little more than 1,000 families representing about 3,500 people through its Angel Tree effort this holiday season.